I have another success story to share with you today–mine! Today marks exactly one year since my family adopted Cooper (formerly Chewchee, or Chewie for short) the six-year-old Beagle/Basset Hound mix. It would be a little strange to do a Q&A with myself, so I’ll just jump right in. But first! If you would like to share your own Orphans of the Storm® adoption success story, please email meetthepooches@gmail.com and I will be more than happy to feature you and your pooch (or cat) on the blog! Since I started volunteering at Orphans of the Storm®, I had been keeping an eye out for a possible new pooch for my family. Our first dog, Dusty the Cockapoo, had passed away a couple years before, and I thought it was about time we got a new four-legged friend. 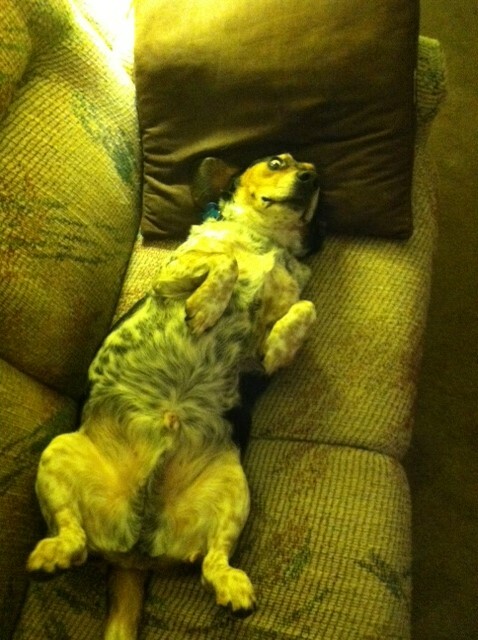 We were looking for a medium-sized, laid-back, middle-aged dog. When I first saw Cooper at the shelter, I loved how cute he was, and how sweet he was, and I felt bad that he looked so nervous and shy. I brought my family back the next day, and we took Cooper out to the off-leash run. He proved that he was a sweet little guy who was happy to just sit at our feet and be pet. Poor Cooper had a bit of a rough start when we first brought him home. He bolted through our screen door after accidentally knocking over a house plant with his cone (which he was wearing since he had just been neutered) (he was perfectly fine; the screen, not so much). He had worms, which cleared up immediately with some medicine. He had kennel cough, which went away on its own after a few days. I think it’s safe to say he wasn’t feeling his best that first week with us. 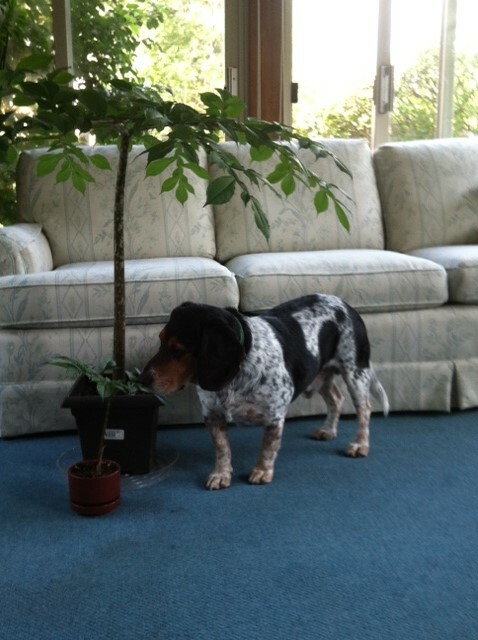 Now Cooper loves the house plants! Cooper was also afraid of basically every single noise. He was afraid of the TV, so if we had it on in the living room, he would go hide in a corner or a bedroom. He was afraid of the refrigerator door opening and closing, cabinets opening and closing, people sneezing, my bed squeaking if I rolled over in the middle of the night (he usually sleeps in my room), you get the idea. He has improved drastically, though he still hides in that same corner for big noises like thunder or fireworks. He also howled at my mom’s snow globes and Christmas music. What a Scrooge. But now watching TV is one of his favorite things! Who would’ve guessed? Cooper’s favorite show is “Too Cute!” on Animal Planet. He prefers the puppy episodes, but has also watched kittens and piglets. 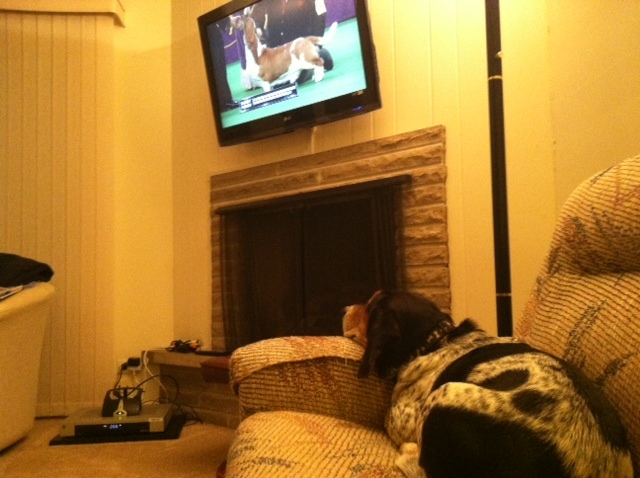 He enjoyed watching The Westminster Kennel Club Dog Show in February as well. Cooper does not like sheep or horses, though, which we learned when my dad rented “War Horse” and when I tried to watch “Babe.” If Cooper could’ve jumped into the TV to get those sheep, he would’ve. We have hypothesized that Cooper had a traumatic experience on a farm, though we’ll never know, since he was picked up by animal control with no collar or microchip, and a bit on the skinny side. 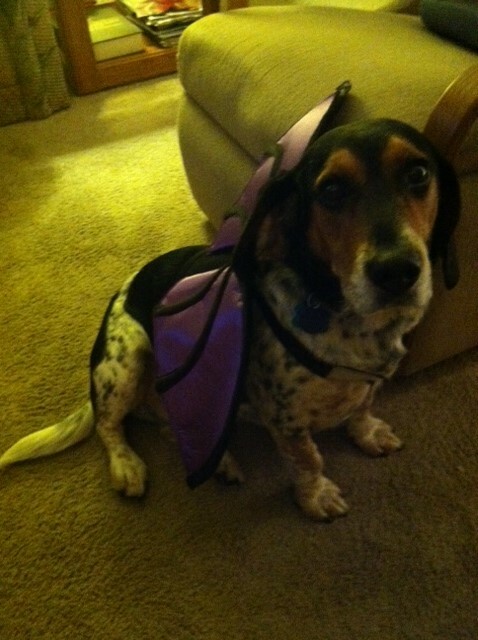 I have sometimes considered submitting Cooper to Dog Shaming. 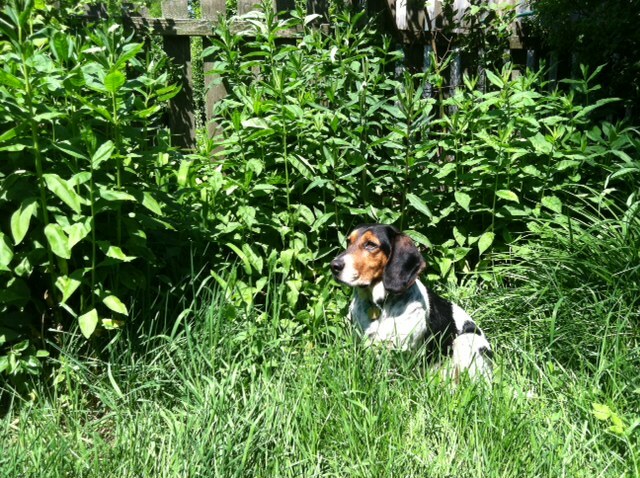 He used to jump up on the dining room table when no one was home, in search of crumbs (no one believes us when we tell them, because he has little Basset legs and everyone thinks he can’t jump. But he can, and we have the claw marks on our tablecloth to prove it); he once ate an entire loaf of cinnamon bread (we checked with the vet and he was fine); and he chewed my mom’s glasses, among a long list of other things. We’ve learned to push in the dining room chairs before we leave, and to not leave things where Cooper may find them and chew them. Now we (almost) always come home to a clean house. We took Cooper to obedience classes, where he was originally too scared to function. After a few months of being in the same place with the same instructor and some of the same dogs, he got a little more comfortable. The instructor always liked to tell the other people in the class, “The first time I met Cooper, I couldn’t even pet him! Now look at him!” (as he jumped up on her to get treats). His only failing by the end of class was that when I told him to “Stay,” he would make a run for the door and attempt to escape. Other than that, he was a star student. We’ve started working with him again in the last couple weeks, and he “Stay”s much better at home where he’s comfortable. Speaking of comfortable, Cooper is a total lapdog, although I’m the only one who sits on the floor with him. He just plops right down and makes himself comfy. Cooper also discovered the couch a few months ago. We originally taught him to stay off the couch (mostly because dogs with long backs like him shouldn’t be jumping up and down all the time), and he never even attempted after his first night at home. But then, one random night in December, he decided that he would give it a try. Now that’s his favorite spot. Unfortunately for me, it is also my favorite spot. We’re still working on how to share fairly. Cooper usually stretches out across two of the three cushions, so I have to resort to curling up into a ball and squishing onto the last cushion. The concept of “fair” is lost on Cooper. Overall, Cooper is a great dog. We’re still working on a few behavioral quirks, but in many ways he is extremely well-behaved. He only barks when there’s an unfamiliar noise, he doesn’t jump around like a maniac to let us know it’s dinnertime (which is what Dusty used to do), he lays down when he knows we’re about to put on his leash, and he’s a great walking buddy (unless the weather is too hot or too cold–then he tries to head right back inside). He loves getting belly rubs, and, of course, he is super adorable. Nothing is better than coming home to a lovable dog who greets you with a wagging tail and kisses. We love our Super Duper Cooper! Thank you, Orphans of the Storm®! 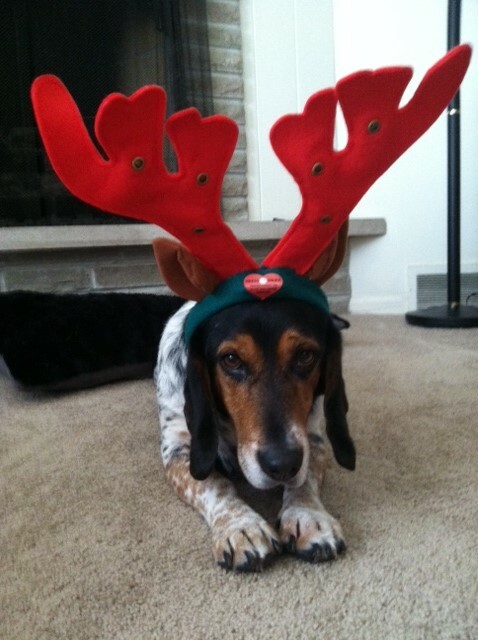 Posted by Meet the Pooches on March 15, 2013 in Interview and tagged adoption, animal shelter, animals, Basset Hound, Beagle, dogs, Orphans of the Storm, pets, success story.